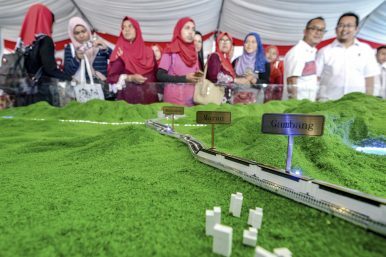 In this Sept. 8, 2017, photo, visitors view a scale model of the ECRL (East Coast Rail Link) during the launching of the train project in Kuantan, Malaysia. Neither of these polarized narratives seems to fully account for the complex and heterogeneous variety of activities in the BRI. From evidence that scholars and researchers have accumulated so far, the BRI presents itself as a set of options to potential host countries. These options often materialize into construction contracts and investment projects, supported by a variety of financing arrangements by Chinese policy banks, the “Big Four,” and state-owned enterprises. No country was ever explicitly coerced to take these options. The BRI makes infrastructural and connectivity-oriented capital available to host country governments, opening funding for economically viable and socioenvironmentally sustainable projects — or white elephant and rent-seeking ventures. There are examples of both types of projects in Malaysia. Under Najib Razak’s government (2009-2018), Chinese-backed projects thrived in what was later described as a corruption bonanza. The TSGP oil and gas pipeline connecting Borneo to peninsular Malaysia and the MPP Malacca-Johor pipeline were most likely used to siphon funds into the 1MDB fund by overinflating project costs. Both projects were later canceled by the newly elected government of Prime Minister Mahathir Mohamad. Even though less than 15 percent of the work was completed, the projects’ contractors were paid the sum of 8.3 billion Malaysian ringgit (around $2 billion), approximately 88 percent of the total value of both ventures, to allegedly pay off time-sensitive 1MDB debts. The contract to build the East Coast Rail Link connecting Kuala Lumpur with the eastern region of peninsular Malaysia proved more difficult to scrap. Mahathir has criticized the need for an exclusive Chinese contractor, meaning the loan from China EXIM will be used mostly to repay China Communications Construction Company, without the need of leaving China, and the project’s overly expensive cost, which according to estimates should be in the range of 35 billion ringgits instead of 55 billion. After negotiations to bring down to cost by roughly one-third, the project is now back on track. However, unlike the overly exaggerated headlines claiming Malaysia is “pushing back” against the BRI, the reality can be rather described with the words of one of its high-ranking officials, as a doctrinal shift away from a transactional mode of foreign policy making into one marked by international credibility and domestic legitimacy. As many have already mentioned, Malaysia-China relations remain friendly and, according to sources, Mahathir’s government is poised to leverage on China’s technology in renewable energy and automation, in line with the country’s Industry 4.0 masterplan. The Malaysian government is also hoping to attract investments into the manufacturing sector and open the Chinese market to Malaysia’s halal and agricultural produce. While Malaysia is quickly learning, leveraging the BRI for economically viable and politically strategic projects has been Indonesia’s game all along. President Joko “Jokowi” Widodo and President Xi Jinping’s relationship can be defined as prolific. For China, this has meant giving away quite a few concessions. One example is the Jakarta-Bandung High Speed Rail link, which is perhaps the only billion-dollar project of its kind that does not require government guarantees. The project has also been designed to make Indonesian and Chinese SOEs work together in a consortium established through a joint venture, enabling technology, skills, and know-how to be transferred. Meanwhile, Indonesia has also been able to attract plenty of Chinese investments in the manufacturing sector, which has helped the country shift its reliance on primary commodity and natural resource exports into more value-added products. The troubled past of Sino-Indonesian relations makes it easy for Jokowi’s adversaries to exploit the “yellow peril” narrative in their arguments. These issues may have helped Jokowi’s government design a comprehensive strategy to employ the BRI as a tool for productive investments and strategic financing in underdeveloped regions. However, only this week’s elections will tell if his strategy has paid off. If executed correctly, the BRI can increase the competitiveness of the Philippine economy. The ongoing implementation or construction of BRI projects — the Kaliwa Dam, Chico River Pump, the South Rail, the Binondo Friendship Bridge, and the Estrella-Panthelon Bridge — have enormous internal demand that could generate self-sustaining payments to Chinese loans. While still being negotiated, the same potential could be said for projects in the pipeline. For instance, the Subic-Cargo Rail project aims to decrease the reliance on trucks to transport assembled chips from Northern Luzon’s special economic zones to the ports. There are also eight other bridge projects and two highways across Visayas and Mindanao, which target the chokepoints that often experience vehicular congestion. Some of the announced projects are targeted to break oligarchic monopolies or diversify the Philippine economy in certain areas. In a recent case, China Telecom won the telecommunications bid with Udenna Group, which would introduce a third player to pressure the existing duopoly. Furthermore, an MOU signed between several Chinese firms and PHIVIDEC Industrial Authority aims to introduce steel manufacturing in the Philippines, which was inspired by the success of the Kuantan Industrial Park in Malaysia. Nonetheless, the Duterte government could have done better in two ways. First, Duterte could have leveraged his “newfound” friendship with China to acquire better deals. Jokowi’s Jakarta-Bandung HSR demonstrates that China can be flexible. Recent reports on the Philippines’ contractual obligations on the approved deals, which include commodity-backed loans and projected payment to consultants, have spurred intense domestic opposition against these projects. Comparatively, these projects are not terrible per se; rather, they are comparable to many BRI and non-BRI Chinese projects across the world. But these issues could have been prevented had the Duterte government acquired better terms. Overall, the above examples show that host country governments have some agency to decide which projects to finance, terms to accept, and conditions to execute. Indeed, if the BRI was a well-thought plan for global dominance, the Chinese government has certainly proved they have much to learn about how to engage and operate outside of China. From shifting political scenarios to negotiating projects that can withstand economic and social feasibility, Chinese companies and the BRI bureaucratic machine will need to better prepare in the future. One last note is an important consideration that observers have finally started to acknowledge. Far from debt traps and yellow perils, the international community should worry about the development model that China is exporting. This model of “pollute first, fix later” has caused the first ever pollution migrants and cancer villages to exist. While this strategy has made China the global manufacturing powerhouse that it is today, according to the Asian Development Bank, this model should be avoided at all costs by developing countries. Hence, the monitoring of environmental conditions and strengthening of relevant regulatory frameworks should become a priority for host countries. And for China, it is crucial to work with domestic and international grassroots movements and civil society organizations rather than see them as a threat. Angela Tritto is a Postdoctoral Fellow at the Institute of Emerging Market Studies at the Hong Kong University of Science and Technology. Currently, she is working on a Hong Kong government-funded project on the Belt and Road Initiative in Southeast Asia.